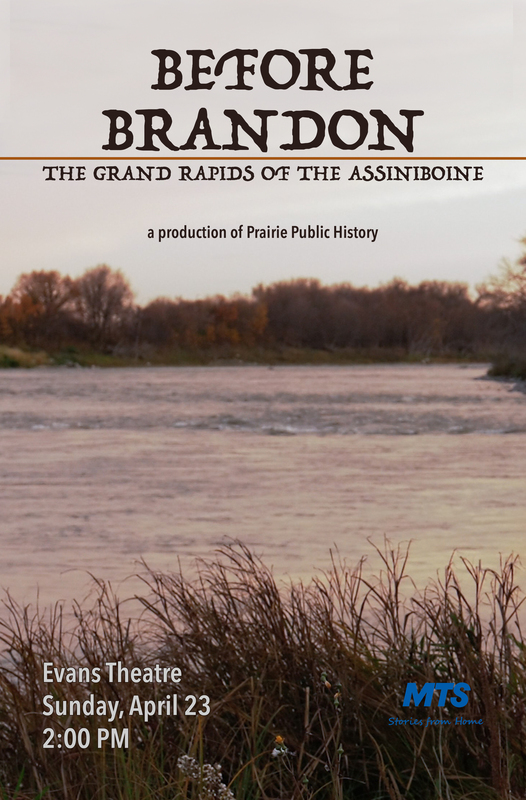 Before Brandon: The Grand Rapids of the Assiniboine is a feature documentary account of a vital geographical site in the history of the eastern prairies that has been lost to contemporary historical memory. You may view the documentary here ( password rapids) . 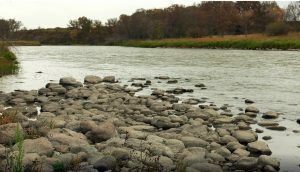 The Assiniboine Rapids (aka the “Grand Rapids”), a sudden eruption of rock and sand a mile in length, and the Rapids Crossing, a natural river crossing just above the Rapids, are located at the southeast tip of the city of Brandon. 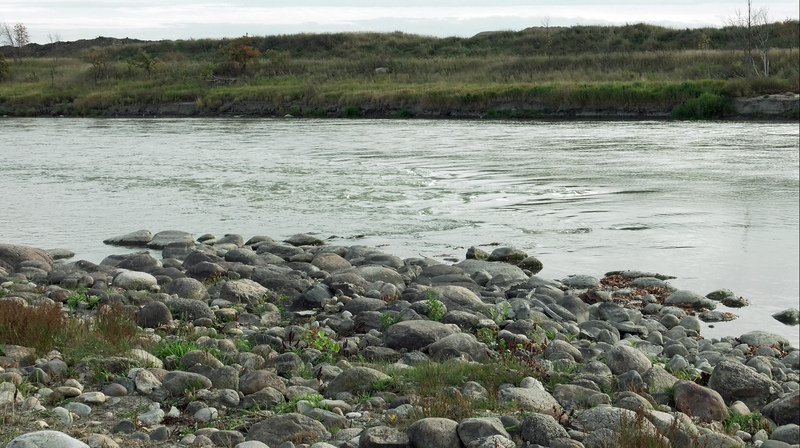 Before it entered history in the fur trade era, the Rapids Crossing served as a passage for Aboriginal travellers going south to trade or to make war. 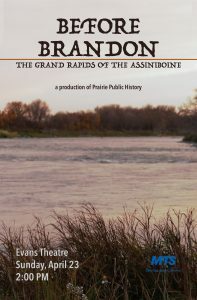 Beginning in the late 1700s, the Rapids had to be negotiated by Hudson’s Bay and North West Company bateau crews freighting north and south on the Assiniboine; and as more traffic developed between the Forks and points further up the Assiniboine to places like Fort Ellice, the Rapids Crossing – just above the Rapids – emerged as crossing point for cart traffic to northwest on the south branch of the Fort Ellice trail. 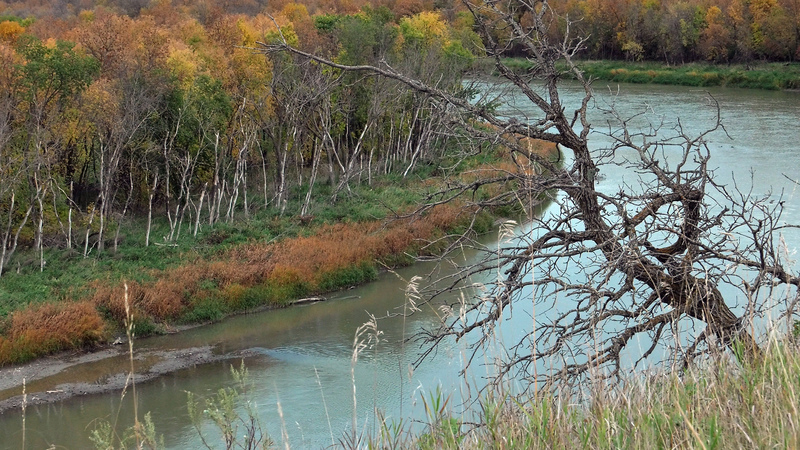 By mid century Métis buffalo hunters from White Horse Plains were also crossing the Assiniboine at the Rapids. In 1849, the Rapids Crossing contingent included 603 Red River carts, 900 Métis and First Nations (men, women and children), 600 horses, 200 oxen, 400 dogs, and one cat. In 1871, the Rapids were deployed as a pivotal point on the boundary of Treaty One that ceded Aboriginal usage rights to Ottawa and opened the West for settlement. Treaty One boundary stretched from the Lake of the Woods in the east, across the bottom end of Lakes Winnipeg and Manitoba, and down to the “crossing at Rapids on the Assiniboine” then south to the 49th parallel. 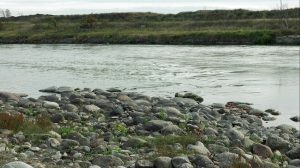 Brandon – on the west side of the Crossing – rests on land relinquished by Prairie First Nations under Treaty Two signed 21 August 1871. In the 1860’s the Rapids gained a new life as a crossing on a cart trail – sometimes termed the Great Trading Route – for Métis traders traveling across the prairies to the foothills of the Rockies. And in the 1870’s the Crossing became an entry point for smugglers taking illicit booze into the West, and for settlers and adventurers looking for opportunity and excitement. In the mid-1870’s, steam boat traffic on the Assiniboine gave birth to Rapid City Landing (soon renamed Currie’s landing) at the bottom of the Rapids. The Rapids – low water, sand and boulders – prevented steam boats from traveling further up the Assiniboine. Travellers disembarked and travelled by ox cart to Rapid City or crossed west at the Rapids Crossing above the Rapids.